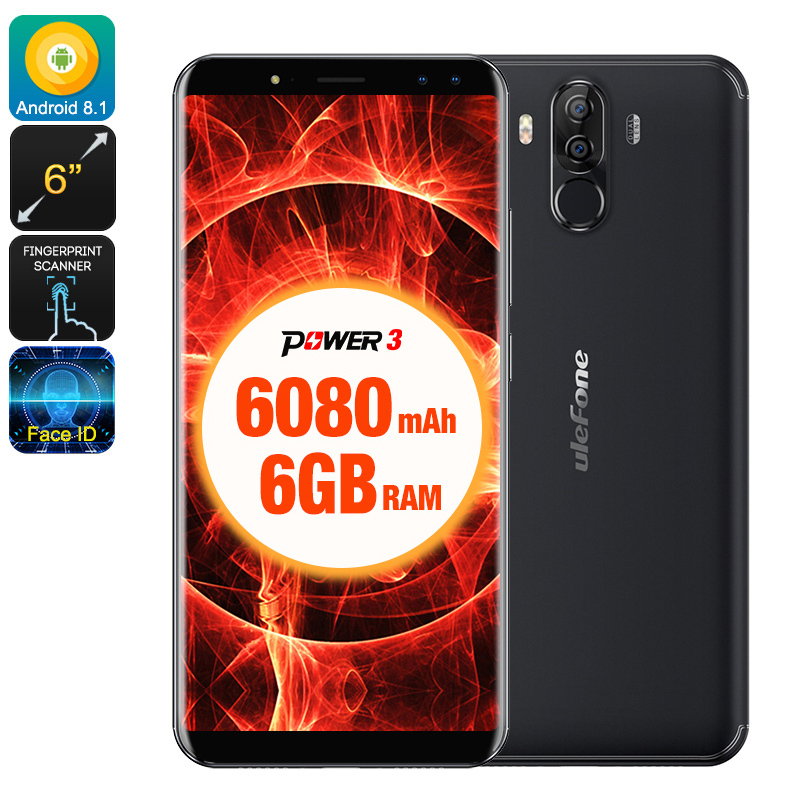 Successfully Added Ulefone Power 3 Android Phone - 6GB RAM, 8 Core CPU, 6 Inch Display, 6080mAh Battery, Android 7 (Black) to your Shopping Cart. The Power 3 smartphone from upcoming Chinese brand Ulefone is brimming with features. Its 6-inch screen is a delight for gamers and movies lovers while an octa-core CPU partnered with 6GB of RAM brings a sensational performance that's sure to leave you loving it. If that wasn't enough the phone packs a massive 6080mAh battery that delivers long usage times so you can enjoy a full day of smartphone fun from a single charge. The phone comes with a standard Android 7.1 Os out of the box but promises to be upgradable to Android 8.1. So you're sure to get the latest flavor of Android when it comes out. Now you have certainty that this phone will run well with all the latest apps and games and you can benefit from the best that Android has to offer. A lush and large 6 Inch display on the Ulefone Power 3 is a joy to look at as the 2160 x 1080 resolutions bring a crisp image while the good color range and screen brightness ensure you'll get a great viewing experience, this makes it a must-have for the game and movies lovers. Sporting a dual rear camera setup with a 5MP and a 21MP camera means your photos have better depth and quality, you can no do away with taking a camera with you as this phone can perform excellently when it comes to snapping shots. There is even a 13 MP front shooter for snapping amazing selfies. Boasting a large 64GB of internal storage the Power 3 phone brings plenty of space for your games, apps, music, and movies. Should for any reason you need more than slip in a micro SD card and benefit from up to 256GB external memory. When it comes to downloading content the phone has the usual Wi-Fi and Bluetooth options but also benefits from the fasted data speeds for cellular devices with its 4G network compatibility letting you use providers on the 2100/1800/2600/900/800MHz frequencies. The Ulefone Power 3 smartphone comes with a 12 months warranty. Brought to you by the leader in electronic devices as well as wholesale Android phones and cool gadgets.